This book invites readers to join in a fresh and extensive investigation of one of Ancient Greece’s greatest inventions: democratic government. Provides an accessible, up-to-date survey of vital issues in Greek democracy. Covers democracy’s origins, growth and essential nature. Raises questions of continuing interest. Combines ancient texts in translation and recent scholarly articles. Invites the reader into a process of historical investigation. Contains maps, a glossary and an index. Eric W. Robinson is Associate Professor of History and the Classics at Harvard University, where he has received the Roslyn Abramson Award for excellence in teaching. He is the author of The First Democracies: Early Popular Government Outside Athens (1997). He has also co-edited with Vanessa Gorman Oikistes: Studies in Constitutions, Colonies, and Military Power in the Ancient World Offered in Honor of A. J. Graham (2002). Ancient Greek Democracy: A Brief Introduction. 1. 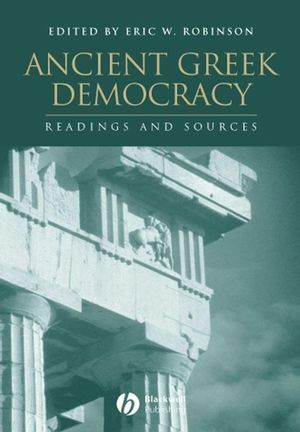 Prelude To Democracy: Political Thought In Early Greek Texts:. Hesiod, Theogony lines 81–97 And Works And Days lines 213-275. Homer And The Beginning Of Political Thought In Greece: Kurt A. Raaflaub. Commentary On Raaflaub: Lowell Edmunds. The Strong Principle Of Equality And The Archaic Origins Of Greek Democracy: Ian Morris. 2. The Beginnings Of The Athenian Democracy: Who Freed Athens?. Aristotle, Politics 1275b34–39 And 1319b2–27. Harmodius And Aristogeiton Drinking Song (Athenaeus 15.50, P. 695ab, With Scholion To Aristophanes Acharnians 980). The Athenian Revolution Of 508/7 Bc: Violence, Authority, And The Origins Of Democracy: Josiah Ober. Revolution Or Compromise? Loren J. Samons. 3. Popular Politics In Fifth-Century Syracuse:. Aristotle, Politics 1315b35–9, 1316a30–4 And 1304a18–29. Diodorus, 11.67–68, 72–73, 76, 86–87. Sicily, 478–431 Bc. : David Asheri. Revolution And Society In Greek Sicily And Southern Italy: Shlomo Berger. Democracy In Syracuse, 466–412 Bc: Eric W. Robinson. 4. Liberty, Equality, and The Ideals Of Greek Democracy:. Euripides, Suppliant Women 346–57, 403–450. Plutarch, Pericles 4, 24, 31–32. Shares And Rights: ‘Citizenship’ Greek Style And American Style: Martin Ostwald. The Ancient Athenian And The Modern Liberal View Of Liberty As A Democratic Ideal: Mogens Herman Hansen. 5. Power And Rhetoric At Athens: Elite Leadership Vs. Popular Ideology:. Demosthenes 21, Against Meidias 1–8, 12–21, 42–50, 70–87, 95–99, 110–112, 123–131, 136–159, 193–197, 208–212, 219–227. Who Ran Democratic Athens? P. J. Rhodes. Demosthenes 21 (Against Meidias): Democratic Abuse: Peter J. Wilson. Power And Oratory In Democratic Athens: Demosthenes 21, Against Meidias: Josiah Ober. 6. Limiting Democracy: The Political Exclusion of Women And Slaves:. Ps-Xenophon, Constitution Of The Athenians 1; 4–8.1; 10–12. Aristophanes, Assemblywomen, lines 57–244, 427–476, 877–889, 938–1056. Aristotle Politics 1253b1–33, 54a10–24, B7–15, 59a37–B4 1274b32–1275a34, B19–23 1319b2–32. The Economics And Politics Of Slavery At Athens: Robin Osborne. Women And Democracy In Fourth-Century Athens: Michael Jameson. Women And Democracy In Ancient Greece: Marilyn Katz. Glossary of Greek Names and Terms.